SOCHI, Russia — Fernando Hierro didn't hesitate when asked if he would be happy to become the Zinedine Zidane of the national team. Hierro took over as Spain coach on Wednesday, shortly after the national soccer federation's shocking decision to fire Julen Lopetegui for accepting a job to lead Real Madrid next season without letting officials know in advance. Hierro's first match in charge will be on Friday against European champion Portugal in the teams' World Cup opener in Sochi. "I couldn't have said 'no,'" Hierro said. "I wouldn't forgive myself." 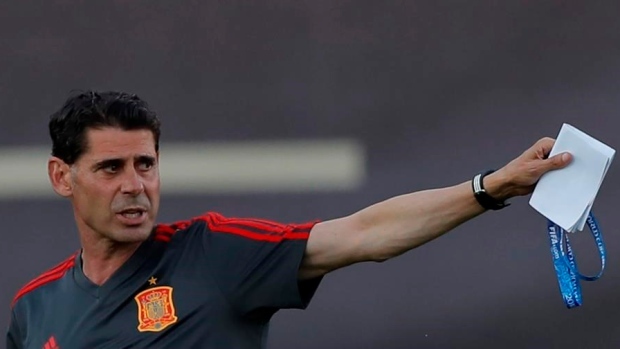 The 50-year-old Hierro, who was acting as the federation's sports director in Russia, has loads of experience as a player but his only head-coaching job was with second-division club Real Oviedo two seasons ago. He had previously been Carlo Ancelotti's assistant at Real Madrid after Zidane left the post in 2014. The former defender spent most of his career with Madrid, including two seasons as Zidane's teammate, before finishing his playing days with English club Bolton in 2005. He has experience from playing in four World Cups with Spain, starting in 1990 and ending in 2002. He also played at two European Championships, in 1996 and 2000. At Real Madrid, he helped the team win five Spanish league titles and three Champions League trophies, including as a teammate of Zidane in 2002. Hierro said coaching remained in his plans but admitted he wasn't expecting it to happen like this. "I like to go step-by-step," he said. "After coaching Oviedo I knew I wanted to coach again. Then this happened with the federation and the circumstances made it possible. This is football, we never know what's going to happen." Hierro didn't have much to say about how he likes his teams to play, but he hinted he will prioritize ball possession. For now, he said, he will try to make as few changes as possible to the team that was coached by Lopetegui. "You can't," the new coach said, "change the work of two years in only two days."